Rabbi Bregman is the rabbi for Beth Tefilloh, a historic synagogue in Brunswick, GA. She is both the first female to ever serve this community and the first resident rabbi in over 50 years. Prior to her position at Beth Tefilloh, Rabbi Bregman served for three years as the rabbi for Open Jewish Project, a grant-funded endeavor under the umbrella of Synagogue 3000 and NextDor. Rabbi Bregman holds a Bachelor's degree from Boston College in Human Development and Psychology with a double minor in Jewish Studies and Studio Art. She would later earn a Master's degree in Human Development from Harvard University and then continued on to Hebrew Union College-Jewish Institute of Religion (HUC-JIR) to work towards smicha or ordination. She spent her first year of school in Jerusalem and stayed for a second year to study Talmud and Mishna at Pardes Institute of Jewish Studies, a liberal Orthodox Yeshiva. Upon returning to the US, Rabbi Bregman completed her studies at HUC-JIR's New York campus. During her four years in New York City, she ran the Soup Kitchen at HUC, served as the student rabbi at the Manhattan Hebrew Association for the Deaf and Brooklyn Heights Synagogue, worked as a chaplain for both Memorial Sloan Kettering Cancer Center and Mount Sinai Hospital as well as became a student chaplain in the US Navy. She strove to learn everything she could both in the class room and out becoming a fellow with Rabbis Without Borders, a subsidiary of National Center for Leadership and Learning (CLAL) and a speaking fellow for American Jewish World Service. 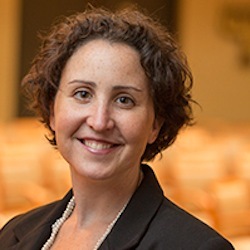 In addition to her position at Beth Tefilloh, Rabbi Bregman serves on the boards of Truah (formerly Rabbis for Human Rights), The Jewish Community Relations Council, and is a founding member of Tzedek Georgia. She has recently been accepted into the first cohort of CLAL's Clergy Leadership Incubator and continues to speak regularly against human trafficking.